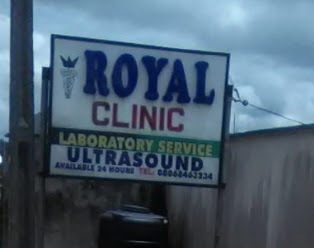 The Warri Area Command of the Nigeria Police Force has arrested the Administrative Head of Royal Clinic, Dr. Walter and another person over the alleged seven months detention of two minors, Kareen Ehikioya and Great favour Ehikioya against their wish by the hospital over four hundred thousand naira unpaid medical bills. At the time of filing this report, the medical director and the other person were making formal statements before the police in Warri. The arrests of the suspects was based on a petition instituted by the Nigerian Child Welfare Fund led by Mr. Joshua Omorere. Mr Omorere who confirmed the arrest had asked the Police to “verify” if Dr. Walter is truly a medical doctor, stressing that his conduct was against the ethics of the medical profession. Omorere claimed that Dr. Walter almost beat up the Chairperson of the Delta State branch of the International Federation of Female Lawyers,IFFL (Litigation Committee) Mrs. Mary Akujobi and other female lawyers for arguing that the girls were held against their wish during their visit to the hospital’s management to find a way out of the matter on 4th of October. It would be recalled that the two minors, Kareen Ehikioya (16yrs) and Great Favour Ehikioya(14yrs) were hit by a vehicle when they were on top of a motorcycle along Udu express road seven months ago. The vehicle owner, Alfred Ogboru rushed them to Royal Hospital and deposited some money for their treatment. After a while, the man who took them to the hospital refused to continue with the payment of medical bills, claiming the accident was caused by the Okada man who was conveying the young girls. The hospital, however, failed to hold the man who DAILY POST gathered is a popular customer. They also did not report the matter to the police. They consequently held the girls back in the hospital for seven months, threatening they won’t be released until the bills are settled.